Pay no attention to the GIA clarity grading, although they call this stunning stone an I1 (based on a few inclusions under the table), unless you possess super vision, this elegantly modeled, beautifully brilliant marquise diamond is eye-clean and magnificently dispersive. The dazzling diamond performs its magic between a pair of sleek baguette diamonds in a classic, hand fabricated platinum mounting. Impressive! 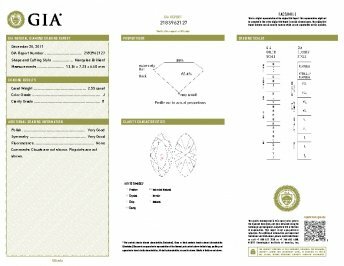 Accompanied by a GIA Diamond Grading Report stating: J color - I1 clarity. Currently ring size 6. Carat Weight: 2.55 carat Because mountings prohibit full and accurate observation of gem quality and weight, all data pertaining to mounted gems can be considered as approximate unless accompanied by an independent laboratory certificate (AGL, EGL, GIA). Unless otherwise stated, all colored stones and pearls are assumed to be subject to a relatively stable and possibly undetected color and/or clarity enhancement.